You are here: Home / Beauty / Art / Facial Symmetry And Picture Manipulation! 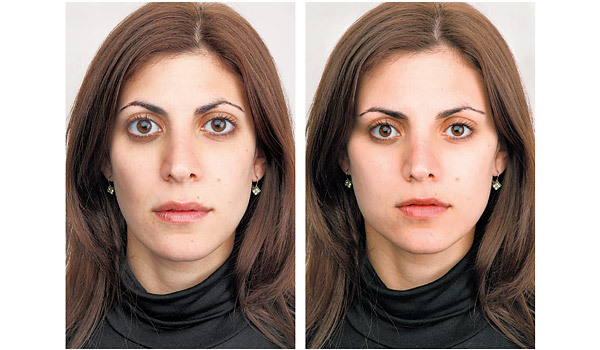 Facial Symmetry And Picture Manipulation! A computer model can come up with the ideal you, but you may prefer your “before” image. IS the woman pictured on the right more attractive than the woman on the left? Do her wider-set eyes, the longer distance between her hairline and the bridge of the nose, and the rounder shape of her face make her more beautiful? The photograph on the right was doctored by the “beautification engine” of a new computer program that uses a mathematical formula to alter the original form into a theoretically more attractive version, while maintaining what programmers call an “unmistakable similarity” to the original. The software program, developed by computer scientists in Israel, is based on the responses of 68 men and women, age 25 to 40, from Israel and Germany, who viewed photographs of white male and female faces and picked the most attractive ones. Scientists took the data and applied an algorithm involving 234 measurements between facial features, including the distances between lips and chin, the forehead and the eyes, or between the eyes. Essentially, they trained a computer to determine, for each individual face, the most attractive set of distances and then choose the ideal closest to the original face. Unlike other research with formulas for facial attractiveness, this program does not produce one ideal for a feature, say a certain eye width or chin length. They ran the photographs of 92 women and 33 men through the engine, creating before and after shots — essentially, a computer-generated version of hot or not. Changes were made only to the geometry of the faces; unlike the digital retouching done for fashion magazines, wrinkles were not smoothed and hair color was not changed. The research, published in the August proceedings of Siggraph, an annual conference on computer graphics, is one of the latest studies in a growing field that merges beauty and science, a subject that has drawn mounting interest in academia in the last decade. Studies have shown that there is surprising agreement about what makes a face attractive. Symmetry is at the core, along with youthfulness; clarity or smoothness of skin; and vivid color, say, in the eyes and hair. There is little dissent among people of different cultures, ethnicities, races, ages and gender. Yet, like the many other attempts to use objective principles or even mathematical formulas to define beauty, this software program raises what psychologists, philosophers and feminists say are complex, even disturbing, questions about the perception of beauty and a beauty ideal. To what extent is beauty quantifiable? Does a supposedly scientific definition merely reflect the ideal of the moment, built from the images of pop culture and the news media? Tommer Leyvand, who developed the “beautification” software with three others at Tel Aviv University and who works in development for Microsoft in Redmond, Wash., said the goal was not to argue that the altered faces are more beautiful than the originals. Instead, he said, it was to tackle the challenge of altering a face according to agreed-upon standards of attractiveness, while producing a result that left the face completely recognizable, rather than the product of cosmetic surgery or digital retouching. The woman, Martina Eckstut, 25, an account executive for Kay Unger New York/Phoebe Couture, volunteered to be photographed for this article and have her image beautified by Mr. Leyvand’s computer program. She said she was struck by how different she looked in the second shot. While several psychological studies over the last few decades also suggest that perceptions of beauty and attractiveness tend to be universal, critics of that work say it is debatable whether a person’s beauty is actually enhanced by such changes. Character can be lost. A blandness can set in. The quirky may become plain. When Mr. Leyvand put a photograph of Brigitte Bardot through his program, her full and puckered lips were deflated, and the world-famous beauty seemed less striking — less like herself. After viewing the before and after photographs of anonymous subjects in Mr. Leyvand’s research paper, Dr. Banner, who is a professor of history at the University of Southern California, said the original faces were more attractive. “Irregular beauty is the real beauty,” said Dr. Banner, adding that such attempts to measure beauty are driven culturally by sameness, making everyone look alike. Artists and architects since the Renaissance — and more recently, plastic surgeons — have tried to quantify beauty using the theory of the golden ratio, which holds that there is an ideal relationship between two measurements that can be expressed as a mathematical constant. Da Vinci, Dalí and Mondrian all are said to have used the golden ratio in their art. Mr. Leyvand suggested there were practical applications for his software, including advertisements, films and animation. He also said he had heard from plastic surgeons interested in the software. That did not surprise those who have studied the history of beauty. I admit I gave Anaface a try and guess what, I’m not a perfect score of “10”! I’m keeping my score to myself. It did give my ego a healthy boost, but it could of easily have gone the other way. I find the little imperfections in people unique and endearing! A gap in between tooth or a tooth overlap and a slightly larger mouth like Angelina’s. « Great Celebrity Make Up Artist’s Tips!